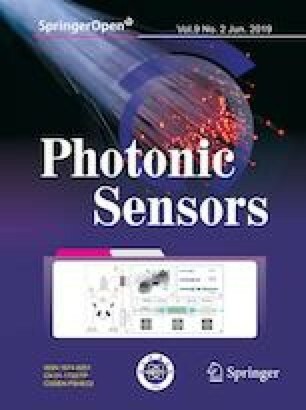 A numerical analysis on dual core photonic crystal fiber (DC-PCF) based surface plasmon resonance (SPR) refractive index sensor is presented. The guiding parameters and required sensing performances are examined with finite element method (FEM) based software under MATLAB environment. According to simulation, it is warrant that the proposed refractive index sensor offers the maximum amplitude sensitivity of 554.9 refractive index unit (RIU−1) and 636.5 RIU−1 with the maximum wavelength sensitivity of 5800 nm/RIU and 11 500 nm/RIU, and the sensor resolution of 1.72 × 10−5 RIU and 8.7 × 10−6 RIU, at analyte refractive index (RI) of 1.40 for x- and y-polarized modes, respectively. As the sensing performance in different wavelength ranges is quite high, the proposed sensor can be used in simultaneous detection for different wavelength ranges. Therefore, the proposed device is of a suitable platform for detecting biological, chemical, biochemical, and organic chemical analytes. The authors thank Dr. Abdul Khaleque for his valuable discussions and contributions for preparing the manuscript.